Chris Osgood admitted that he toiled with the decision for a while, but the three time Stanley Cup-winning goaltender announced it was time to hang up the skates. The 38 year old Chris Osgood is leaving the NHL with 401 career wins, and 317 of them were with the Detroit Red Wings. He won the Stanley Cup twice as a starter with the Wings, and once as a back up goalie. Osgood played 14 seasons with the Wings, and the other 3 were with the New York Islanders and St. Louis Blues. Detroit General Manager Ken Holland also announced that Osgood would in fact have a future with the Red Wings. 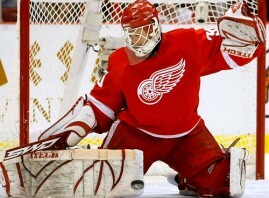 He will be brought on board as a goalie consultant, and he will help mentor the Red Wings goalies. Holland also said he will be signing another goalie to back up Jimmy Howard by the end of the week.